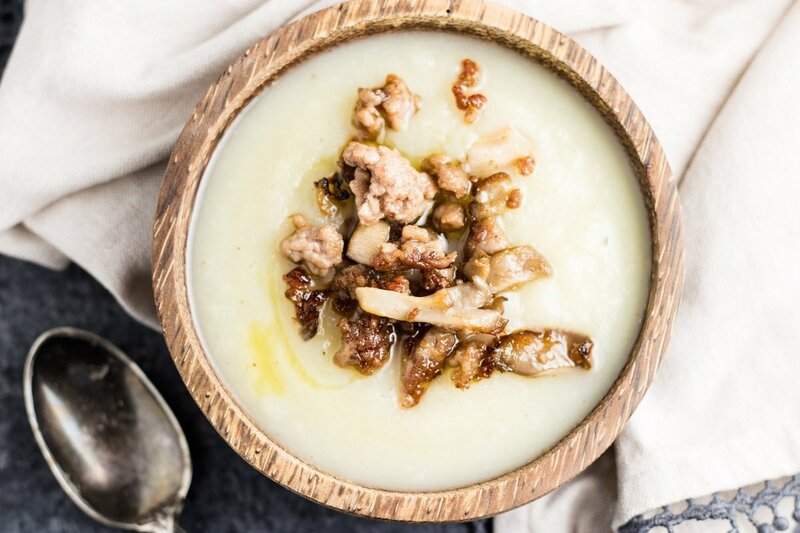 Ready in about 30 minutes, this yummy Low FODMAP Parsnip Soup with Crispy Pork and Oyster Mushrooms is a delicious way to warm-up! 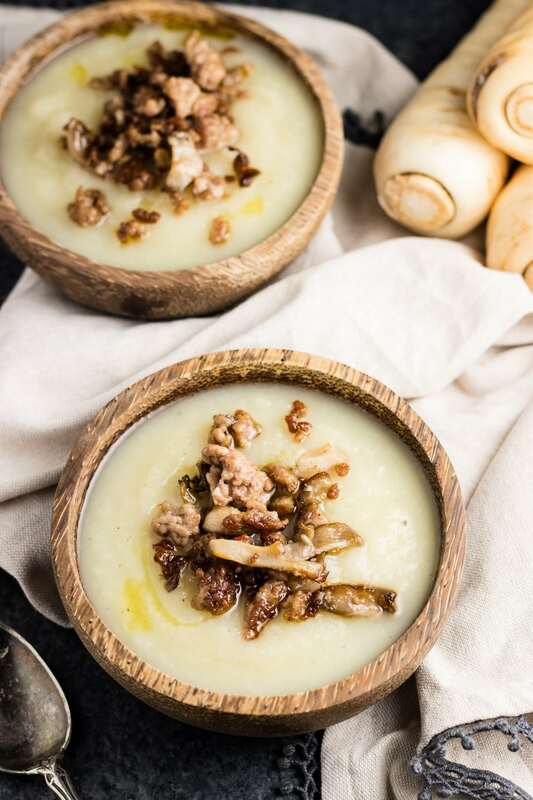 Okay, Minnesota weather isn’t too unbearable (yet) and you have full permission to roll your eyes at my bad twist on lyrics, but I really am all about this parsnip soup (and Christmas music once November 1st rolls around). ← Who’s with me?! ? 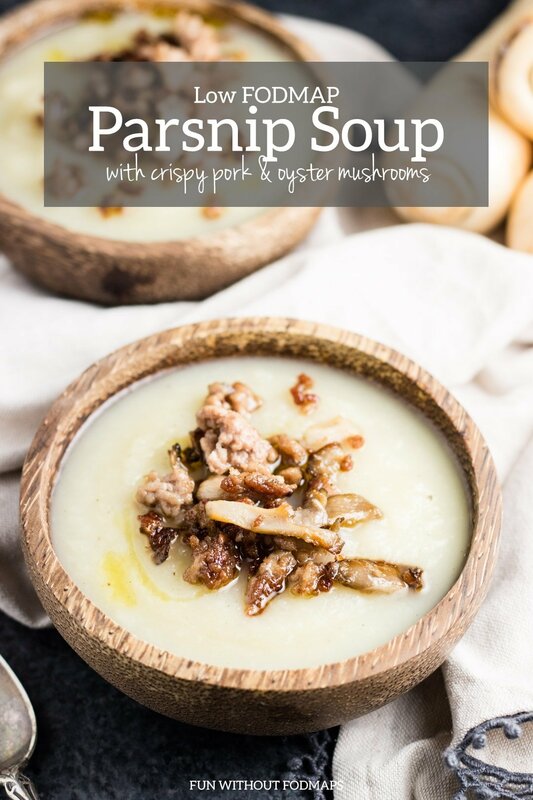 This Low FODMAP Parsnip Soup features parsnips (shocker, Em) but it’s also topped with a yummy garnish of crispy pork and oyster mushrooms. And before you discredit me and my Christmas-songs-turned-food-blog-promos completely, yes, you can have (certain) mushrooms while low FODMAP-ing and yes, I’ll share more deets below. But first, let’s talk parsnips. Parsnips are one of those fun FODMAP-friendly veggies. Why fun? Well, when they were tested by Monash University – no FODMAPs were detected! Meaning, we can eat them freely, according to our appetite, while low FODMAP-ing. Hooray! As much as weighing and tracking food can be helpful tools (for some people) during a FODMAP experiment, they’re really no fun to do long-term. Instead, I try to eat intuitively and according to my appetite as much as possible. Parsnips are also pretty versatile. You can roast ‘em, mash ‘em or like in today’s soup, puree ‘em until smooth. Now back to FODMAP-friendly mushrooms. It’s true most mushrooms are high in mannitol, one of the polyols (the P in FODMAP). So, unless you know you tolerate mannitol (luckily, I do! ), mushrooms tend to be pretty non-existent on most low FODMAP menus. However, oyster mushrooms have been tested and are considered low FODMAP in servings of 1 cup or 75 grams. I will admit they’re a little bit harder to find (at least in rural Minnesota), but when I do, I do a little happy dance. Because I think mushrooms are the da bomb. So, I get a little (over) excited. Why? Mushrooms add a blast of umami to savory dishes. They’re a great way to make meat go further and can be a more sustainable option. And, they pair deliciously with the crispy pork (which I like to think of as more of a garnish) on top of this soup! Place parsnip pieces into a large pot and cover with chicken broth. Bring to a boil and cook for 15 minutes or until the parsnips are tender. Remove from heat and carefully blend with an immersion blender. Stir in sage and season to taste with salt and pepper. Set aside. While parsnips are cooking, cook pork in a skillet over medium-high heat until pork is browned and just crispy. Drain excess fat, if desired. Add olive oil and mushrooms and cook until mushrooms are tender. Season with salt and pepper. 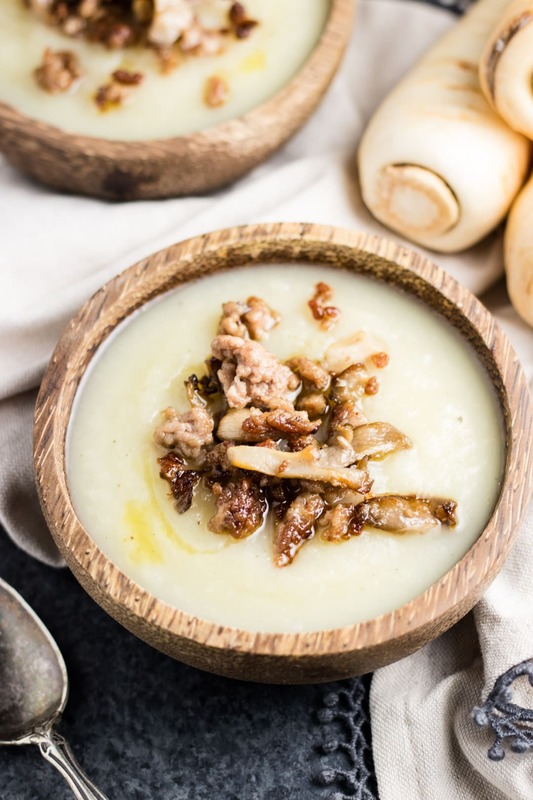 Scoop soup into bowls, drizzle with an additional swirl of olive oil (optional), and top with pork and mushroom mixture. Serve warm. Oyster Mushrooms: A low FODMAP serving is 1 cup or 75 grams. 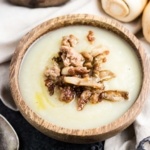 Low FODMAP Chicken Broth: My slow cooker broth recipe is linked in the ingredients, but if you want a quick option I like to use FODY Foods Low FODMAP Chicken Soup Base. I use 1 Tbsp. + 2 tsp. of the base for 6 cups water. No Immersion Blender? If you don’t have an immersion blender, a blender will work. Allow cooked parsnips and chicken broth to cool before carefully blending small(!) batches in a blender until smooth. Hot liquids have the potential to expand in the blender, so small batches are important. I made this tonight, and used bacon instead of the pork, and we loved it. My husband who can eat anything and has no food intolerances enjoyed it. Thanks for posting, and filling our stomachs! Thanks for sharing, Mary Lou! Glad you enjoyed it!